Paul Celan (November 23, 1920 – approximately April 20, 1970), was the most frequently used pseudonym of Paul Antschel, a Jewish author who wrote primarily in German, one of the major European poets of the post-World War II era. Celan's poetry is among some of the darkest written in the twentieth century. His life was irrevocably changed by the events of the Holocaust: both his parents perished, and Celan himself spent years struggling to survive in labor camps and ghettos. Shortly after his liberation at the hands of the Red Army, Celan began circulating a poem entitled Todesfuge (Death's Fugue) which remains one of his most enduring works, and one of the earliest literary depictions of life in the death camps. Celan's poetry was primarily influenced by the French Surrealists such as Guillaume Apollinaire and Jean Cocteau. 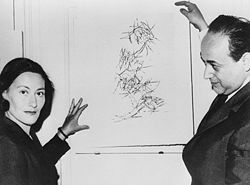 Like the Surrealists, Celan attempted to reinvent poetry from the ground up; he was famously praised (and occasionally, criticized) for trying to "break apart" the German language, and as his style matured his poetry became increasingly cryptic and experimental. To some degree, Celan wrote the way he did as a response to Theodor Adorno's famous statement that "writing poetry after Auschwitz is barbaric"; Celan believed, despite all he had experienced, in the redeeming power of art and language, and although his memories of the holocaust would ultimately drive him to suicide, his poetry is nevertheless one of the most moving documents of an artist's struggle to make meaning from the darkest materials. Celan was born in 1920 into a German-speaking Jewish family in Cernăuţi, Bukovina, then part of Romania. His father, Leo Antschel, was a Zionist who advocated his son's education in Hebrew. His mother, Fritzi, was an avid reader of German literature who insisted that German be the language spoken in their house. After his Bar Mitzvah in 1933, Celan abandoned Zionism and terminated his formal Hebrew education, instead becoming active in Jewish Socialist organizations and fostering support for the Republican cause in the Spanish Civil War. His earliest known poem, titled Mother's Day 1938 was a sentimental, if earnest, profession of love. In 1938, Celan travelled to Tours, France to study medicine (Romanian university quotas on Jewish students after the Anschluss precluded Celan from studying at Bucharest and Vienna), but he returned to Cernăuţi in 1939 to study literature and Romance languages. His journey to France took him through Berlin as the events of Kristallnacht unfolded, and also introduced him to his uncle, Bruno Schrager, who later was among the French detainees who died at Birkenau. The Soviet occupation in June 1940 deprived Celan of any lingering illusions about Stalinism and Soviet Communism; the Soviets quickly imposed tyrannical reforms on the university where he was studying, and the Red Army began deporting dissidents and "undesirables" to Siberia. On arrival in July 1941 the German Schutzstaffel and their Romanian allies burned down the city's six-hundred-year-old Great Synagogue. In October, the Romanians forced the Jews into a ghetto, deporting a large number of them. While living in the ghetto, Celan translated William Shakespeare's Sonnets and continued to write his own poetry, while also being exposed to traditional Yiddish songs and culture. Before the ghetto was dissolved in the fall of that year, Celan was pressed into labor, first clearing the debris of a demolished post office, and then gathering and destroying Russian books. The local mayor strove to mitigate the harsh circumstances until the governor of Bukovina had the Jews rounded up and deported, starting on a Saturday night in June 1942. Accounts of his whereabouts on that evening vary, but it is certain that Celan was not with his parents when they were taken from their home on June 21 and sent by train to an internment camp in Transnistria, where two-thirds of the deportees perished. Celan's parents were taken across the Bug River and handed over to the Germans, where his father likely perished of typhus and his mother was shot dead. Later, after having been taken to a labor camp, Celan would receive notification of his parents' deaths. Considering emigration to Palestine and wary of widespread Soviet antisemitism, Celan left Soviet-occupied territory in 1945 for Bucharest, where he remained until 1947. He was active in the Jewish literary community as both a translator of Russian literature into Romanian, and as a poet, publishing his work under a variety of pseudonyms. The literary scene of the time was richly populated with surrealists, and it was in this period that Celan developed pseudonyms both for himself and his friends, including the one he took as his pen name. A version of Todesfuge appeared as Tangoul Morţii ("Death Tango") in a Romanian translation of May 1947. The surrealist ferment of the time was such that additional remarks had to be published explaining that the dancing and musical performances of the poem were realities of the concentration camp life. Night and Fog, another poem from that era, includes a description of the Auschwitz Orchestra, an institution organized by the SS to assemble and play selections of German dances and popular songs. Almost all of the members of the Auschwitz Orchestra would be exterminated before the end of the War. As Romanian autonomy became increasingly tenuous in the course of 1947, Paul fled Romania for Vienna, Austria. It was there that he befriended Ingeborg Bachmann, who had just completed a dissertation on Martin Heidegger. Facing a city divided between occupying powers and with little resemblance to the mythic city it had once been, when it had harbored an Austro-Hungarian Jewish community long since shattered, he moved to Paris in 1948, where he found a publisher for his first poetry collection, Der Sand aus den Urnen ("Sand from the Urns"). His first few years in Paris were marked by intense feelings of loneliness and isolation, as expressed in letters to his colleagues, including his longtime friend from Cernăuţi, Petre Solomon. In November 1951, he met the graphic artist Gisèle Lestrange, in Paris. They married on December 21, 1952 despite the opposition of her aristocratic family. During the following 18 years they wrote over 700 letters, including a very active exchange with Siegfried Lenz and his wife, Hanna. He made his living as a translator and lecturer in German at the École Normale Supérieure. Celan became a French citizen in 1955, living in Paris until his suicide by drowning in the Seine river in late April 1970. It, the language, remained, not lost, yes, in spite of everything. But it had to pass through its own answerlessness, pass through frightful muting, pass through the thousand darknesses of deathbringing speech. It passed through and gave back no words for that which happened; yet it passed through this happening. Passed through and could come to light again, "enriched" by all this. Do not read any more - look! Do not look any more - go! In later years his poetry became progressively more cryptic, fractured and monosyllabic, bearing comparison to the music of Anton Webern. He also increased his use of German neologisms, especially in his later works Fadensonnen ("Threadsuns") and Eingedunkelt ("Benighted"). In the eyes of some, Celan attempted in his poetry either to destroy or remake the German language. The urgency and power of Celan's work stem from his attempt to find words "afterwards," to bear impossible witness in a language that gives back no words "for that which happened." In addition to writing poetry (in German and, earlier, in Romanian), he was an extremely active translator and polyglot, translating literature from Romanian, French, Portuguese, Russian, and English into German. There has been a recent flurry of translations of Celan's poetry into English. The most comprehensive collections are Michael Hamburger's, which has been revised by him over a period of more than two decades, and Pierre Joris'. Joris has also translated his work into French. Many of the English editions are bilingual. A French site with a few recordings of Celan reading a selection of his poems, including "Todesfuge"
This page was last modified on 27 January 2019, at 23:26.